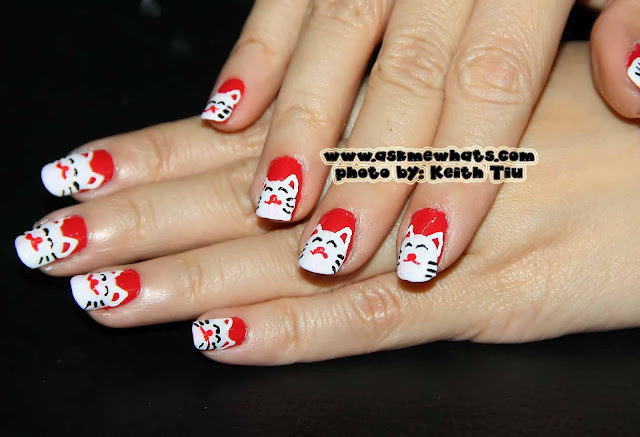 Everyone knows how much I like to create "themed" nail art designs when I travel! 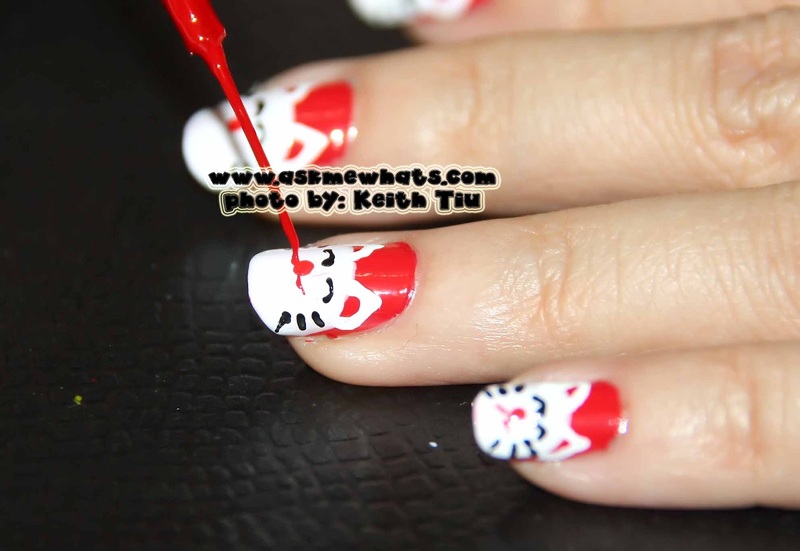 Since I'm in Japan, some expected nail art designs would be the Japan Flag or Cherry Blossoms! Japan Flag may be nice but I'm not sure how the Japanese may want to see a Japanese Flag on a tourist's nails! *hehehe* Cherry Blossoms is the best bet but I've done Cherry Blossom inspired nails quite a number of times! (Check HERE and HERE). 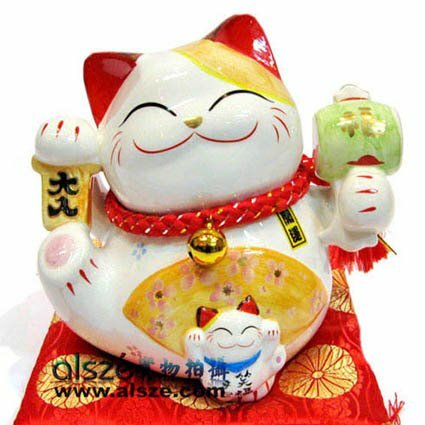 Since I'm wishing for luck this year not only for me but also for my family and friends, I thought of creating the famous "Maneki Neko" cat which is also known as the "Beckoning Cat", "Welcoming Cat", "Lucky Cat", "Fortune Cat", "Money Cat" or just plain....(in my dictionary) "Super Cute Cat"! I researched on cute photos and prayed that I will give justice to the cute face of Neko! Choose the brightest and luckiest red polish shade you can find. In my case it's Bright Red nail polish with hint of orange to it from Revlon called 640 FEARLESS. Applied a base coat prior to the nail polish base application. Please make sure the 2 coats of Revlon Fearless Nail Lacquer is completely dry before you move on to the next step! This tip is very important for the polish not to be mixed together. 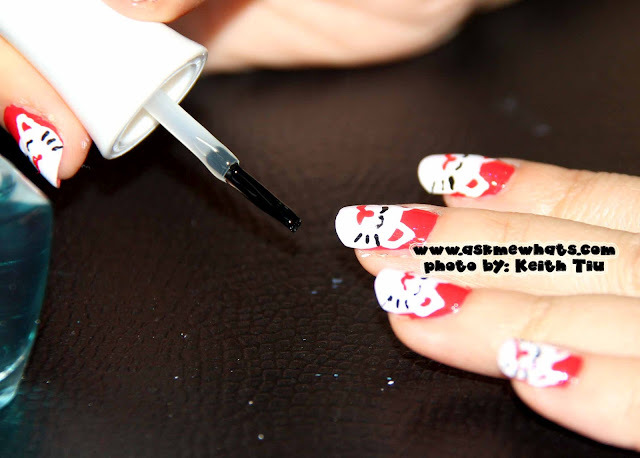 Pick a matte white polish, create a "semi circle" as seen on photo below. Apply 2 coats if necessary. 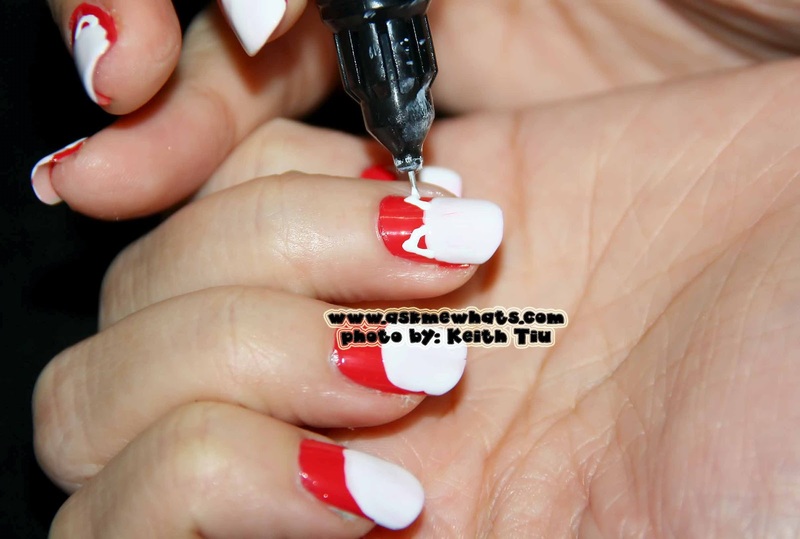 With a 2 Way Nail Art Pen in White or any nail art brush, create the "ears" leaving a space in between for the red polish to pop. 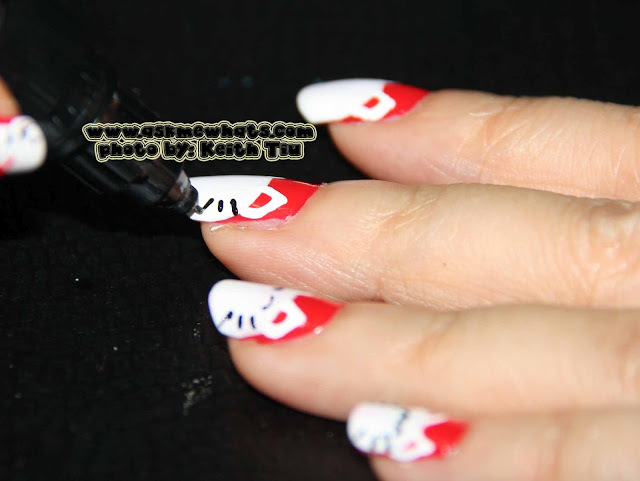 With an art brush or if you have 2 way nail art pen in black, create the whiskers as shown on photo below. I started with the whiskers so I have an idea on the space left to draw the eyes and nose. You can create open-eyed Neko, but I like them with their eyes closed! My nails aren't that spacious so drawing open eyes may take up more space! 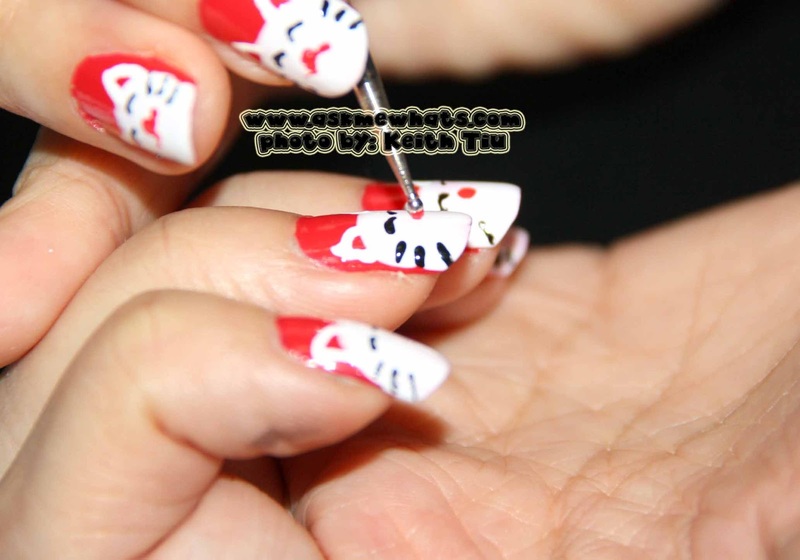 With a nail art dotting tool, dot the same red polish used as base for the nose. With L.A. Colors Art Deco Polish in Red, draw the smiling lips with 2 wave like motion! 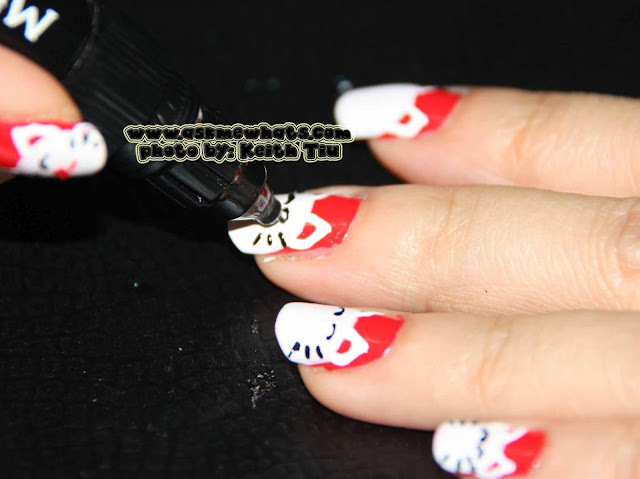 Make sure the nail art designs are COMPLETELY DRY, top it with your choice of top coat to protect your nails. I am using the one from The Face Shop which I bought in Korea. It's time for me to do the "waving" arms and wish everyone goodluck!!! Do you like Maneki Neko the cat? Do you own one at home? 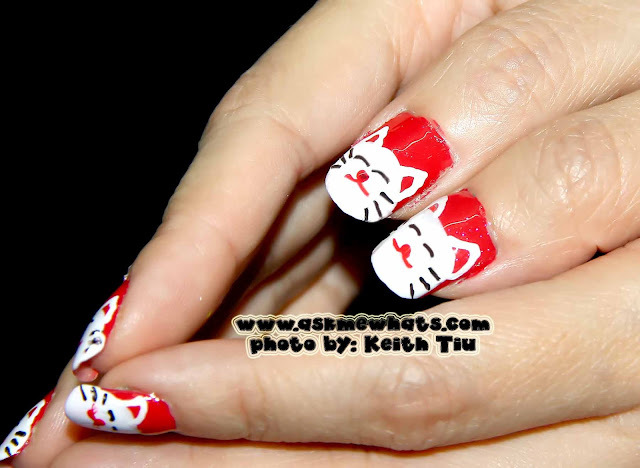 We don't have those in Korea but I really do like the nail art! Very cute! glad you liked it Plue :) Thanks! Where can I buy the dotting tool and nail art pen? where are you currently located? If outside the Philippines, you can try Ebay :) if you're comfortable online shopping! I'm not the anonymous commenter above but I'd like to know also where to buy the dotting tool and nail art pen. I'm in the Pasig-Mandaluyong area. =) Thanks. Same comment as above, you can try Ebay or there could be some local resellers on Multiply but I haven't really purchased from them.